Richard Cross. Photo courtesy of Tom & Ethel Bradley Center. The California State University, Northridge Tom and Ethel Bradley Center has received a grant for $315,000 from the National Endowment for the Humanities (NEH) for the creation of a digital database of the Richard Cross 1950-1980 Photographic Collection. The Tom and Ethel Bradley Center holds a photographic collection of more than 1 million negatives, slides and prints produced primarily by American photojournalists. The core of the center’s archive is a large collection of photographs produced by African-American photojournalists. “We are extremely honored that the NEH found our proposal worth funding,” said Bradley Center Director José Luis Benavides. 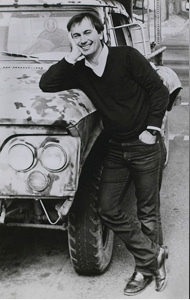 “In partnership with the Oviatt Library, we intend to make accessible to the public this unique collection by an American photojournalist who had a significant career in journalism and visual anthropology, before he was killed by a land mine at the border of Honduras and Nicaragua, along with Los Angeles Times reporter Dial Torgerson. The Bradley Center aims to add and improve access to the world’s repository of images of black life in Los Angeles, and digital images of black communities in Latin America and Africa. In this regard, Benavides added, digitizing Cross’ photographs of Palenque de San Basilio will increase access to the imagery of contemporary black life in communities founded by runaway slaves across the Americas. The comparisons that emerge in this visual dialogue of black communities in the United States and Colombia, Benavides hopes, will foster dialogue between Latino and African-American communities, including communities of scholars in the humanities. “It will also create new, publicly accessible visual records of the conflicts in Central America from a viewpoint that is closer to its main actors — the people of Nicaragua, Honduras, El Salvador and Guatemala — and the need to cast light on the struggles of diasporic Central American communities in the United States,” he said.